Picture 14A-30. The third group of Birney cars in Champaign-Urbana, no. 116-120, was built by American Car Co. on order #1390 in 1924. These were the last new streetcars ever in Champaign-Urbana. The group is represented here by no. 116 on the Short Line as it crosses Burrill Avenue on the University of Illinois campus on the private right-of-way, eastbound for downtown Urbana. The Men's Old Gym (now Kenny Gyn) and the Old Armory (now Kenny Gym Annex) are in the background. 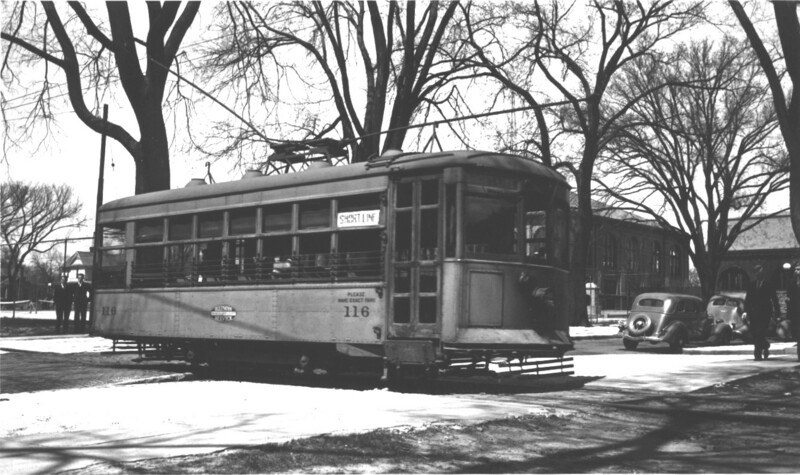 This picture was taken April 18, 1936, just a few months before the end of streetcar service. — R. V. Mehlenbeck photo.